The Interstate 27 extension effort continues to build momentum. Last week State Rep. Dustin Burrows filed a bill that would launch a feasibility study for the extension of I-27. Rep. Burrows has shown strong leadership in support of Ports-to-Plains, and now it is our turn to support him. First of all you can follow the link below to add your name to our resolution supporting the extension of I-27. Secondly, you can plan to attend one of the TxDOT Freight Planning Workshops that will be held across the state over the next month, and be sure to let them know that extending I-27 is a priority. For those outside of Texas, we continue to work hard for transportation investment and improvements throughout the entire corridor. 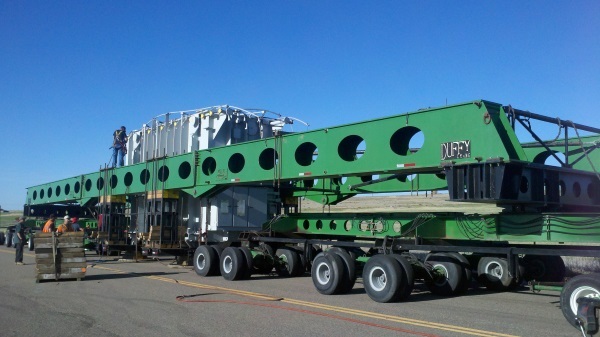 This newsletter contains news from Colorado where the legislature will be facing transportation funding, as well as questions at the federal level about a much talked about infrastructure package and what it means for rural communities. Thank you for your continued support. It is the key to our success as we move foreward. The proposed extension of Interstate 27 will serve three border crossings with Mexico at Del Rio, Eagle Pass and Laredo. Texas State Representative Dustin R. Burrows (HD-83) filed House Bill 869 today, legislation directing the Texas Department of Transportation to conduct a feasibility study of extending Interstate Highway I-27 from Lubbock to Laredo. "This bill would direct TXDOT to examine a critically needed expansion of I-27, which currently ends in Lubbock. Given the economic and population growth West Texas has experienced during the last 20-years, the continuation of the interstate to Laredo would allow for further industry and business expansion along the route," said Burrows. "President-elect Trump has stated he will pursue substantial national infrastructure improvements and my bill positions West Texas to be ready with a solid plan for the I-27 expansion," Burrows added. Michael Reeves, Executive Director of the Ports to Plains Alliance, a group of over 275 communities and businesses who advocate for transportation infrastructure improvement, said “We wholeheartedly support Rep. Burrows’ bill which will facilitate a critical next step in our efforts to extend Interstate 27. Texas does not have a major north-south Interstate west of I-35. An extended I-27 will boost economic growth and opportunity in West Texas, while serving as a much needed alternative to the congested I-35 corridor." Lubbock Mayor Dan Pope said "From an economic development perspective, the extension of I-27 would be a huge boost, not only to Lubbock's economy, but to virtually all of the communities along the interstate. A thorough TXDOT study would certainly prepare us for the next step in this process." Is I-27 in Midland’s future? Just one day before the start of the 85th Legislature, efforts to improve transportation in West Texas got a small shot in the arm. Rep. Dustin Burrows of Lubbock filed a bill Monday seeking to direct the Texas Department of Transportation to conduct a feasibility study that would see Interstate 27 extend south of Lubbock to Laredo. 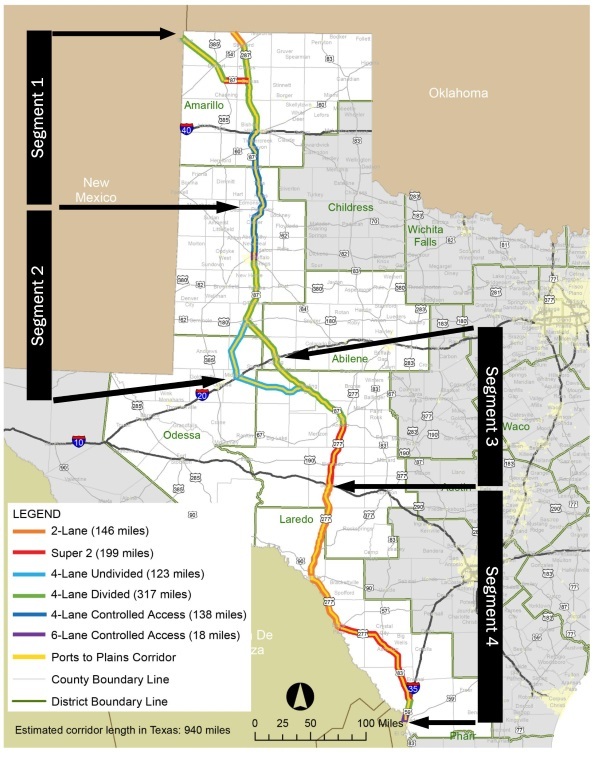 The bill supports the activities of the Ports-to-Plains Alliance, a Lubbock-based organization that seeks the conversion of the congressionally recognized Ports-to-Plains corridor into interstate-grade highway and designated as I-27. The project is a long time coming. “The Ports-to-Plains highway has been talked about for as long as I can remember,” Burrows told the Reporter-Telegram. 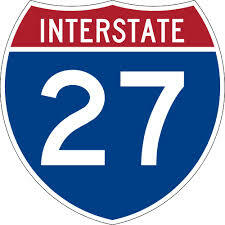 I-27 is unique among interstates in that its southern terminus does not connect to another interstate. Now is the right time to pursue a feasibility study to get it connected, Burrows said, because pro-infrastructure president-elect Donald Trump will soon take over as the nation’s executive. “Ideally, once we have a new president, who called for a large infrastructure package to be delivered from the federal government, I want Texas to be in the best place to potentially highlight this project as one of the opportunities to do infrastructure expansion,” Burrows said. While Ports-to-Plains does not necessarily endorse all of the views in the article below, it does a reasonable job in describing the concerns that rural America has regarding the Trump Infrastructure concept. The question being discussed is: How will 80% of the National Highway Network identified as rural benefit from the potential of $1 trillion of infrastructure funding? ...Infrastructure for profit is going to pan out better in some places—big cities, places with money—than others. (Though public-private partnerships also favor new projects over maintenance, which complicates the picture a little, and toll roads over transit.) While Democrats have typically favored large federal investments in public works, the people who benefit most from such programs are often rural Americans who depend on government largesse. The rural-versus-urban theme shined through at other moments: in Sen. Ted Cruz’s request that the apportionment formula be adjusted to benefit fast-growing Texas, or in Sen. Cory Booker’s (exaggerated) claim that the Hudson River Tunnels carried the entire population of South Dakota between New York and New Jersey every day. (Actually, it’s about one-fifth the state’s population, but you get the idea.) On the flip side, Alaska Sen. Dan Sullivan complained about how few roads his state had—fewer miles than Texas and even Connecticut—despite its size. The reason, of course, is that Alaska has barely one person per square mile, making it about six times less dense than Wyoming. Which all goes to an important point: the Trump-Chao plan to draw private dollars into infrastructure investment is not likely to bring more roads to Alaska, South Dakota, or West Virginia. Lo, it has come to pass." As in the past, the Ghosts of Christmas Past and Future for transportation will reappear at the state Capitol in January as the General Assembly convenes. As in the classic story “A Christmas Carol” by Charles Dickens, the specter of Christmas Past will pay a visit and reflect on previous failed legislative sessions where promises were made to address our growing transportation issues that are now moving toward a crisis stage. The specter of the past will share visions from the prior five years, showing legislators conducting similar debates and hearings, making almost identical speeches and statements, spending endless hours in committee meetings, reviewing innumerable special reports of our transportation needs and financial shortfalls, and considering numerous bills and proposed solutions, only for all of them to be heaped on the bonfire of failure. As in the past, the final act in the play will be legislators placing blame on the other party for the lack of action. At the same time, the Ghost of Christmas Future will also materialize. Only this time, he will share an even darker future for the state showing even more congested roadways with longer commute times, further deterioration of our roadways and bridges, and more accidents associated with a lack of adequate funding for the infrastructure. The ghost will show a bleak future, 20 years from now, where our state population has grown by 48 percent, overall traffic has risen by 64 percent and traffic delay for the average commute will have increased by 30 minutes. Can we, like Scrooge, have a happy ending and avoid this dismal future of clogged highways, potholes, deteriorating bridges and the like? The definitive answer is yes, but it will require strong leadership and bold action on the part of both parties in the General Assembly as well as an engaged Governor to forge consensus on a funding measure to go to the voters. To accomplish this goal, let me offer some suggestions to our legislators. 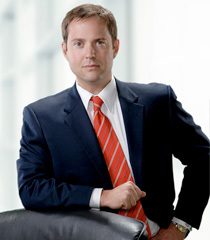 Jeff Cummings is president and CEO of Duffy Crane and Hauling, one of Colorado’s oldest companies. He is a past chairman and current director of the Colorado Motor Carriers Association, which represents more than 600 companies involved in trucking in Colorado. Laredo, Tuesday, Jan. 31, 8:30 a.m. - 11:30 a.m.
Cities in North Dakota’s oil-producing counties have added infrastructure to accommodate expected growth as the industry recovers from the downturn in oil prices. But as drilling and production activity pick up, more growth will strain the ability of cities to keep pace with needs of a growing population. That’s the key takeaway from a Six-City Study completed by AE2S Nexus on behalf of the Western Dakota Energy Association. The results of the study, the cost of which was shared by the six cities, were presented to state legislators at the Capitol on January 9, 2017. The study shows that even at the tail end of a slow-down, an impending and likely oil price recovery will continue to place significant demands on the six cities studied, with each still facing aggressive population growth under a moderate oil price recovery scenario. The cities are expected to see their population grow at rates ranging from 2.8 percent annually in Williston, up to 5.7 percent per year in Watford City. Past investments by the state and cities in trunk infrastructure such as transportation corridors, water supply, and wastewater treatment have positioned the cities for further growth. And while a moderate oil price recovery is expected to significantly increase city revenues, it will likely not be sufficient to meet the anticipated needs of each city. Cities in the oil-producing region will remain heavily dependent on major revenue sources such as the gross production tax on oil and local sales taxes to offset projected demands. But funding gaps will remain. Further unique financing strategies will be required to meet the projected gap, requiring solutions at both the local and state level in order to address the forecasted needs of each city.